This is a OP Shader Operational Service Miniature Medal with Clasp and Ribbon. The medal size is approx 19mm in diameter. Made in the United Kingdom. This medal is unmounted. We can mount medals and stock most medals. If you have any questions please do not hesitate to contact us. It is manufactured by Eekelers-Centini Intl, of Hemiksem, Belgium. 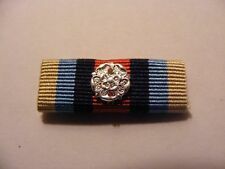 The "Afghanistan" Clasp is awarded for service specifically in Afghanistan. It replaced the GSM 1962 - 2007. CANADA OPERATIONAL SERVICE MEDAL - HUMANITAS (REPLACEMENT QUALITY). Condition is Used. Dispatched with Royal Mail 2nd Class. CANADA OPERATIONAL SERVICE MEDAL - SUDAN (REPLACEMENT QUALITY). Condition is Used. Dispatched with Royal Mail 2nd Class. CANADA OPERATIONAL SERVICE MEDAL - HAITI (REPLACEMENT QUALITY). Condition is Used. Dispatched with Royal Mail 2nd Class. The reverse also features the four crowns, representing the Royalty (top left), Navy (top right), Army (bottom left) and Air Force (bottom right). CANADA OPERATIONAL SERVICE MEDAL - EXPEDITION (REPLACEMENT QUALITY). Condition is Used. Dispatched with Royal Mail 2nd Class. Africa Star Ww2 Military Medal British Commonwealth Operational Service Copy! ‘SIERRA LEONE’. COPY OF A FULL SIZE MUSEUM QUALITY DIE STRUCK. This is a Operational Service Miniature Medal with Afganistan Clasp and Ribbon. The medal size is approx 19mm in diameter. Made in the United Kingdom. This medal is unmounted. We can mount medals and stock most medals. If you have any questions please do not hesitate to contact us. MEDALS - OSM. OPERATIONAL SERVICE MEDAL FOR SIERRA LEONE - FULL SIZE. 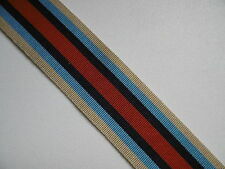 ( OSM ) SIERRA LEONE & RIBBON. It seems likely that a separate ribbon will be awarded for each campaign. or Displaying On Military Uniforms etc. A MINT CONDITION FULL SIZE SWIVEL. It has so far been awarded for operations in Afghanistan (from 11 September 2001), Sierra Leone (5 May 2000–31 July 2002) and the Democratic Republic of the Congo (14 June–10 September 2003). ‘AFGHANISTAN’. SERVED IN AFGHANISTAN. OR OTHER OPERATIONS WITHIN THE BORDERS OF AFGHANISTAN SINCE 2002.